The film, which was commissioned by the Higher Education Quality Design Forum, explores the re-use of old buildings in higher education. The Clarence Centre for Enterprise and Innovation was until recently a Georgian pub connected to a number of disused terraced buildings. Following years of lying derelict, LSBU- in association with architecture practice Rivington Street Studio- have redeveloped the site into a centre for entrepreneurs; many of them former LSBU students. Comprised of office space, single desks for hire, a café and retail units, the centre is set to become a hub for the community too- as well as boosting the local economy. Also featured in the film is LSBU's Student Centre, which opened in November 2012. 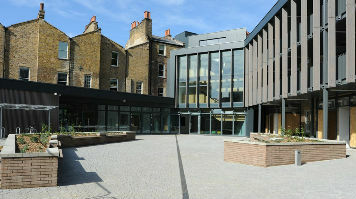 The Centre, which was renovated by HawkinsBrown, was previously a disused area underneath the University's Tower Block building, which was predominantly used as a loading bay. It now houses a host of services for students to make the most of, including a café, student employability services, the Students Union, and a bar. The design of the building has also been awarded with the Architects' Journal Retrofit Award for Higher Education. Resurrection can be viewed on YouTube. More information on the Student Centre and the Clarence Centre for Enterprise and Innovation can be found on the LSBU website.